On Monday we went on a lunch cruise on the Paddle Steamer Emmylou. The weather was perfect, lots of winter sun with a few clouds to cool you down from time to time. It was soooo relaxing. The rhythmic slap of the paddles in the background while we sat at the back of the boat watching the wake and the forested banks as they passed by, helped along with a glass or two of Chardonnay and a meal of flathead tails. Along the way we had a good view of the refurbushed Echuca Wharf. The Murray is very full, so we were able to see over the banks along the journey, which added to the interest. Today, Wednesday, we travelled east from Echuce along the Murray, crossed the Goulbourn River to Cape Horn Vineyard to enjoy a wood fired oven cooked pizza washed down with their rose. It was delicious and well worth the drive. Really pleased you’re getting some sunshine and chill time (that could be a good book title!). Enjoy your few weeks away and we’ll see you soon. Thinking of you both. 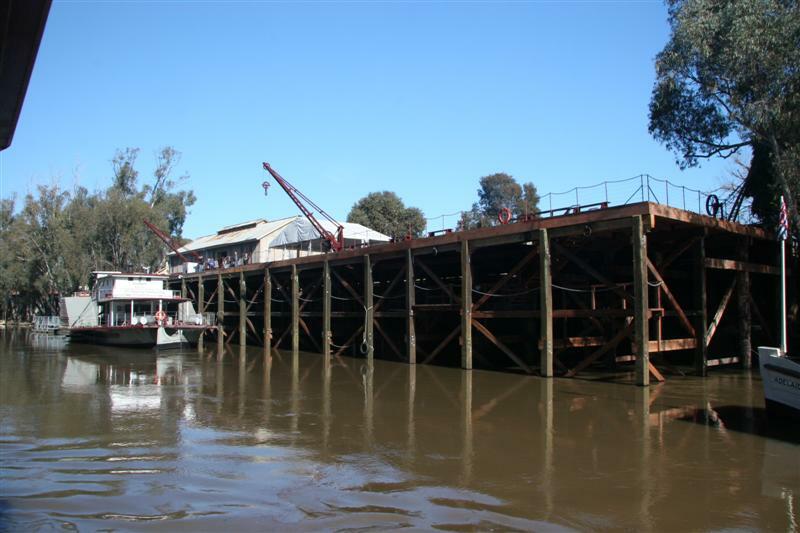 Your blog brings back mixed memories of Echuca. I remember a great weekend and lunch at Morrisons winery. Last year I was also there with Dulcie but thought Morrisons had deteriorated – maybe it just wasn’t the same without you buys> I also remember a disastrous weekend with an aboriginal group when they all got drunk, had an enormous fight, the police were called and one person went to hospital with broken ribs. All in all – it was never boring. Glad that you are relaxing and having a good time and getting warmer weather than Melbourne which is freezing.